Can't remember where I got this little sight from but it's a cracker!! Excellent sights - Ive got a couple. 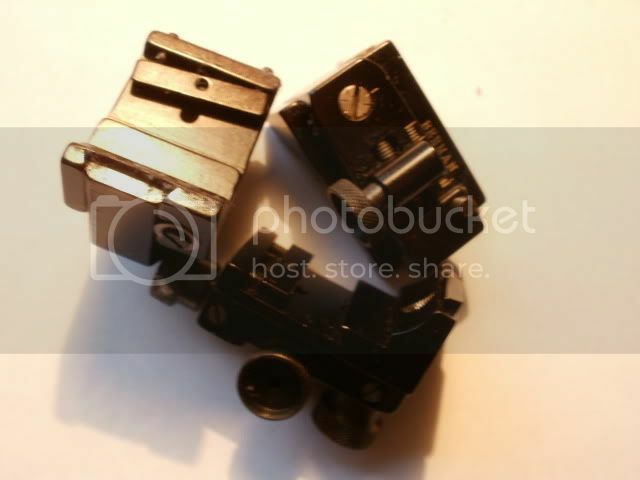 I have seen them with 'Williams' or 'Beeman' markings and with screw driver adjustment or knurled knobs. Ive got one on a HW77 which has a HW interchangeable foresight unit on. As an exponent of modern target rifle shooting, I find it quite interesting in how old ideas come around again. All the manufactureres of the top target sights are working to get them smaller whilst still having as much adjustability as possible, the principle being a small sight is better to allow sighting and wind observation. There is also the principle in standing shooting that ballance is better with a less restricted view, so shooters restrict the size of eye blinder (idealy not using one) and sights are getting smaller. This tiny sight caught my attention as its similar to a Duguid sight, made in very small numbers as one offs, and now out of production. They are being used very successfully in smallbore prone by several shooters, the Duguid has a bit more precision and fine adjustment and the eye piece is taken to a further extreme by being clear and made of persplex but the principles are very similar. I have a HW35 and am currently using a a diopter sight as seen on 10 meter match rifles. It extends about 2" behind the action and provides a comfortable and open sight picture. I would like to tidy things up with a more compact aperture sight like the Williams, but am worried that I would have to crane my neck to get a good sight picture. Can you tell me if you find the Beeman comfortable to use and does it provide an acceptable view. I may be sticking my neck out here but I suppose it does depend on the length of your neck amongst other things. What suits one person may not suit another. 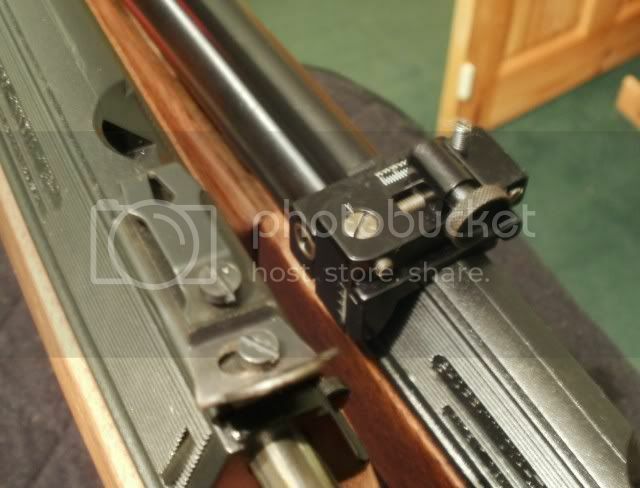 I dont find any problem is using my HW77 fitted with a Williams sports peep sight but then I dont use it for 10m paper punching just informal target shooting. I do know that the apertures vary in size. I think I'll give the Williams/Beeman peep sights a try. For the record--the "Beeman" peep sight is indeed made by Williams here in the US. 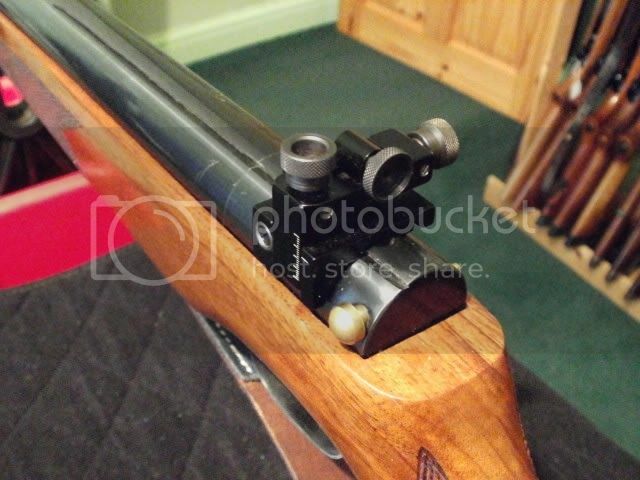 They actually make several models with the same longitudinal-bar-type adjustable mount, that are suitable for airguns. Their "FP" series are compact sights with clicking elevation and windage adjustments. The model FP-AG is the basic model with screw adjusters, and suitable for a comparatively high sight line seen on most airguns. The FP-AG TK is the same sight with target knobs (and is the variant typically seen in "Beeman" garb). The FP-GR series has a longer mounting base and lower sight line. These are more intended for rimfire firearms with grooved receivers, though some airguns such as the classic Diana model 50 favor it as well. Again available with screw (FP-GR) or target knob adjusters (FP-GR TK). Williams has recently introduced a version of their simpler (and much less expensive) "5D" series, with simple screw-slider elevation and windage adjustments, having the versatile bar mount. The 5D-AG is the higher-sight-line version, and 5D-GR the lower one. The 5D series is best known to US airgunners through the 5D-SH which has been a popular upgrade for Benjamin and Sheridan pneumatic rifles for many years. Their web site very well illustrates all these models.